One by one, the Greenport High School boys basketball team players and coaches climbed up the purple ladder in the school gymnasium at the basket on the south end of the court and cut another piece of the net off. It was freezing outside the Greenport High School gym, with temperatures dropping in the 20s. Inside the gym, Pierson’s boys basketball team was on fire. The emergence of Greg Gehring revitalized Southold’s offense and gave the First Settlers a high school boys basketball tournament title over the holiday break. But not even Gehring’s inspired play, or Pat McFarland’s scoring ability, was enough Saturday when the First Settlers ushered in the new year with a loss. Steady shooting by Pierson — from deep range, too — enabled the Whalers to register a 69-57 victory at Southold High School. Sooner or later, the end comes for all of them, the great players and the no-so-great alike. On Thursday night, it was Liam Walker’s turn to make his exit from his storied high school basketball career. The final result seemed virtually assured by the time the fourth quarter started, so Walker and his Southold teammates couldn’t help but see the end coming. When it became official with the final buzzer at Pierson High School, Walker carefully untucked his jersey, took off his wristband and joined his teammates as they lined up to shake hands with the Pierson players. Disappointment was written across the senior’s face. 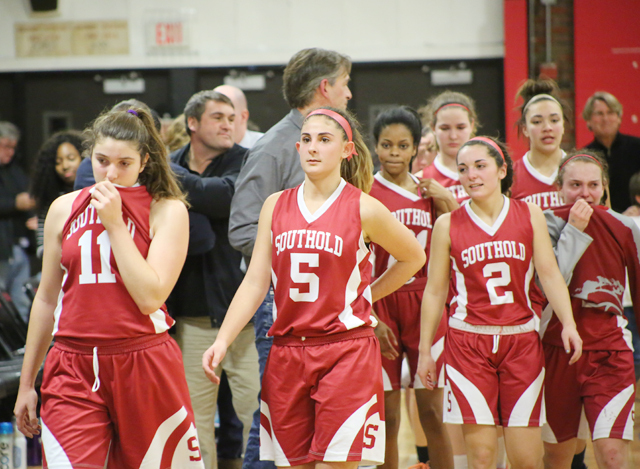 Just like that, the high school career of one of the best players to wear a Southold uniform came to an end. It’s just two games into the high school boys basketball season, and Mattituck already has a title and a shiny new addition to its trophy case. With the Suffolk County League VIII boys basketball game all but decided, Pierson’s Robbie Evjen burst through the middle of the lane to attempt a layup. He was sent flying to the floor as a result of a pushing foul by Southold’s Liam Walker with 49.1 seconds to go. The Pierson bench was unhappy with the foul, and Pierson coach Dan White exchanged heated words with Southold coach Phil Reed, a conversation that resumed after the game.